My first Sherlock cross stitch! - I see better from a distance. 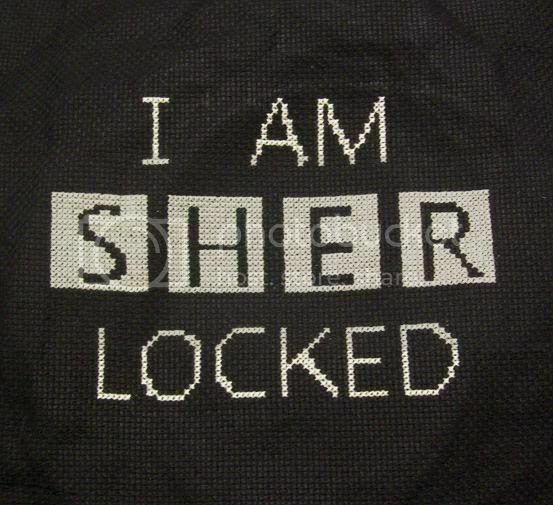 My first Sherlock cross stitch! Yesterday, when I was in downtown Fredericksburg, I saw a few "Believe in Sherlock" and "Read Dr. Watson's blog" posters on the walls! Awesome. I'm not the only Sherlock fan here. Yay, New York Giants! Had fun last night watching them upset the Patriots in the Super Bowl. I still can't believe the Redskins beat them twice. Twice! The REDSKINS. They must have had off days when playing them! The commercials were so-so this year. The only really memorable one was the Matthew Broderick ad for Honda- reliving Ferris Bueller's Day Off. So cute! LOL! Old post is old! Unfortunately, I no longer have the pattern. It was on my old computer which crashed two months after I made it. :( I've seen much better charts on etsy. Here's one chart for sale- I've ordered from her many times. Her stuff is great and it's available as an instant download.